Warning: GET READY for some GRAPHIC PICS. Making tattoos look positively tame, an absurd, grotesque body-modifying procedure is apparently all the rage. 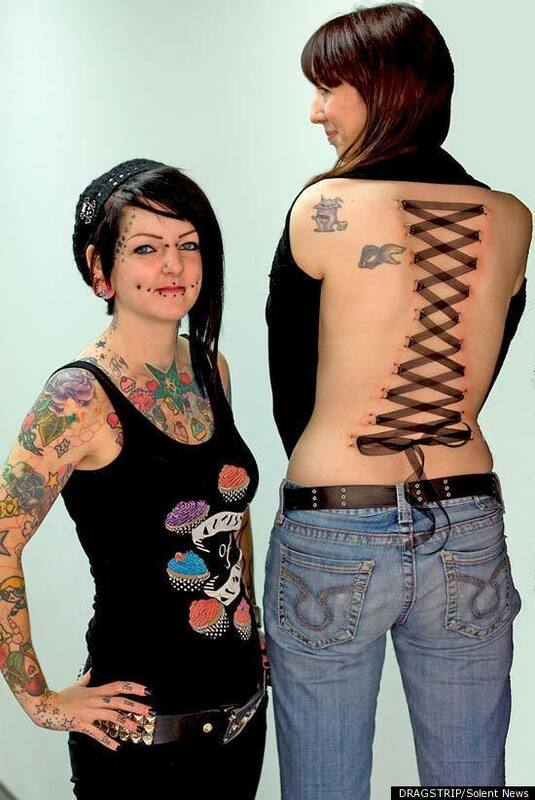 On Thursday, the Daily Mail has introduced the masses to corset piercing, a fad that involves piercing multiple metal loops into the skin and threading zig-zagged ribbon through them like a corset. Unsurprisingly, the doctors quoted by the Mail warn against threading a hook through your skin and then tugging on it really hard. "'Any piercing, superficial or otherwise, produces a scar and different people scar in different ways," said consultant plastic surgeon Kevin Hancock, a council member of the British Association of Aesthetic Plastic Surgeons. He cautioned that "for some, the scarring may be slight but for others it can produce problems where the tissue overgrows and you end up with a red lump which is permanent." In a word: yikes. The trade-off for scars is temporary body decoration. "It only lasts for three to four weeks and after that it will just grow out," said one piercing artist in England, who admitted, "It does leave a few red scars." But it's totally worth it for people who want to make a painfully dramatic style statement. Noted the piercing artist, "We get a lot of different people asking to have it done -- one was a 45-year-old mum who wanted it done for a tattoo convention... Others have it done because they want to look nice for a particular occasion." The reality is that this counterculture trend has been around for years, at least since the late 1990s. So thank you, Daily Mail, for heightening our awareness about a trend that's super gross and also super old. We'll keep this one in mind for our next "particular occasion" -- Mother's Day, perhaps? Read the rest at DailyMail.co.uk.